Because my father watches Supergirl , I have now seen a few episodes. I note that they were written on the presumption that Hillary Clinton would be elected President, and thus that the character of the President is played by Lynda Carter imitating the voice and speaking patterns of Ms Clinton — so far, no cackle — albeït with the character named Olivia Marsdin . And here's what is truly telling: In this fantasy, people who do not freely support Madam President are physically assaulted by state officials. For saying that she is Not my President. a fellow has his thumb wrenched by DEO agent Alex[andra] Danvers, who later begins to beat information out of him even though he is not even so much as a suspect. 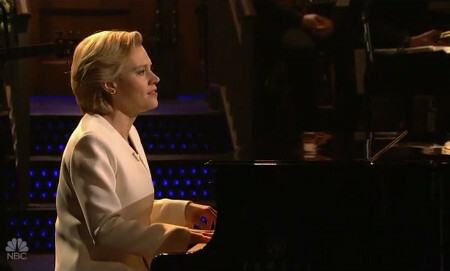 It seems not to have occurred to writers, to producers, to directors, nor to starring actors that their heroes in an imagined world guided by Hillary Clinton were doing things that would seem thuggery if done by champions of a social order directed by Donald Trump. Yet the shoes were merely on the other feet — or, in this case, mistakenly presumed to be so. I'm not a great fan of Star Trek , for reasons that I won't labor here; but at times it provides useful cultural references. 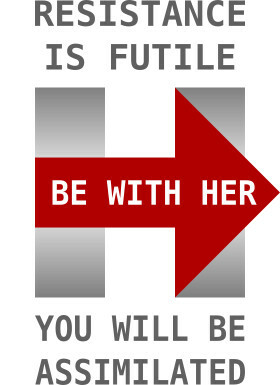 Various people have drawn a comparison between the Clinton campaign and the Borg, prompting me to put together this logo And then to make stickers and magnets with it available at CafePress. Presumably anyone voluntarily displaying one of these magnets or stickers would be doing so ironically. While the image is under investigation, the items on which it was to be placed are unavailable. A decision is supposed to come within 48 hours of the announcement. Of course, someone at CafePress may make a partisan call; such actions have become commonplace. In that case, I will look for a different service through which to get things produced. Up-Date (2016:07/29): Resistance continues. CafePress simply chose to misrepresent the design as in violation of their stated content policy. So, as I said that I would, I've begun migrating to alternative vendors. I will also be billing CafePress for my labor.